I just completed my first talk show, which you can listen to on the right. I had a technical glitch - apparently I had seven people waiting to talk to me, but I was not able to see their calls, so I thought there was only one person on the line. After the show, I contacted Blog Talk Radio to find out how to fix it and why the glitch happened. It will be fixed before next week so I hope those of you who called in will call back! I'm so sorry I didn't get to talk to you, I would have loved it. I do want to thank Betty from Savannah who carried the show for me; I really appreciate it! I wasn't exactly funny on the air, except in the sense that when people are terrible at something, it's kind of funny. But, I am not giving up yet, I will do the show every Tuesday at 2:00 pm CA time through August, and I'll either get better or give up; but I'll give it a go for a while. It was fun and a new challenge for me. Probably painful for listeners but that can change. I spoke about creating items for sale on Zazzle and want to tell you a story about that. I had a different kind of problem with that creation - see my upside down flower up and to the right? Well, I don't own the rights to it. I got this blog template off a free site, and if you will scroll down you will see that I linked back to the template designer as I was asked to do. 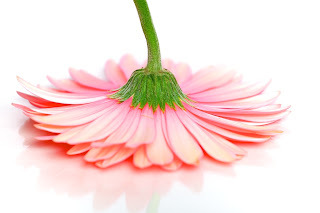 I have wanted to use the upside down flower in my zazzle designs because it has become meaningful to me: it is symbolic off the fact that I was drafted into this pink world of survivorship against my will, and I think others see it that way as well. I tried to contact the original designer to get rights to the photo, but there is nobody there anymore; the website seems dead. I checked using whois, and the domain is set to expire in January. I then looked at places like iStockphoto and priced out pink gerbera daisies. The price was way beyond my means - to buy them to use for products would cost me about $800.00. I doubt I'll ever make $800.00 in sales, at least not with the royalties you get from zazzle I won't! I want the zazzle store for a little money, sure, but I know it'll be very little. The idea is more for the fun of creating things and getting excited if somebody buys something, and also providing cancer patients with ideas for things they need than it is to support myself. Anything that comes from there, like anything that comes from the donate button, goes straight to my son's college fund. Community College all the way! I told some friends my dilemma about the flower, and one came through in a big way. My friend Toine got a flower and actually took that photo and gave me all rights to it. Isn't it gorgeous? There is so much detail. Please click on it - you can see every little part of the flower - almost like you can see individual cells, it's that detailed. He put it on a piece of plexiglass to give it that lovely reflection on the bottom so it's even better than the original. Best of all, I own the rights to use it how I want. And, that gives me comfort because that site my template is drawing from expires in January and that photo that I have identified with for two years might go away. Now I have my own. (At some point, I will figure out how to get it on my website). You can see by going to his site that he has the ability to capture more than just a person's shape; he can really get into their personality. I admire his talent with a camera. I have always wanted to be able to do that - many years ago, I even owned a fine camera (for its day) and took lessens. But, no matter what I did, my photos came out blurry and lit wrong and to this day, they still do. Even with a point and shoot I can never get it right. It requires a lot of skill to become a photographer, but not only that - to take really great photos requires talent. Which Toine has in abundance, along with a large dose of kind-hearted spirit. So, I learned I have a generous friend, I want to share him with any of you who need a photographer, and I now have a flower logo to use. And, now to annouce the soft opening of my Zazzle Shop. There are only a few items in there so far. But, there will be more coming daily and not all items will be the same as they are now. So far, each item is something that I think is really important for a newly diagnosed cancer patient to have. We need a binder for our records, a whiteboard to jot quick notes, a notebook to keep track of appointments and medications and for chemo brain, just about everything. And, a tote bag to take items like blankets and iPads to the chemo infusion room each week, and thank you notes for all those people who will be kind to you. And, you can't have a shop without a mug, can you? Take a look around and check back regularly as I will be adding things daily. It takes at last 24 hours for new items to show up so I have some in the pipeline you can't see yet. And, another glitch - the binder is posted backward. Nothing quite goes right the first time around, does it? You should get on etsy too, Ann! I'm not a breast cancer survivor but I am a mug whore, Ann, so I'm ordering the 15 oz white with black interior because I love reading you and I love what you are trying to do for mets patients and of course, for your son. As far as etsy goes, I have something in the works but I'm not quite talented enough to make something by hand. I do make cards but am such a perfectionist and each one takes so long that I could never make money at it. We'll see. The longer I'm unemployed the more I am going to need things to do! Congrats on the Talk Radio show and the new, beautiful flower. I agree it's better than the original, and I'm happy that you will be able to use it because you have all the rights to it. It's great to find a great photographer, isn't it? I will definitely let you know how it looks in person. I've moved from New York to Florida so my plan is to take it to work with me when I start working again down here & maybe spark up some awareness in my own little way. BTW, I don't know why this shows Jezebel as my name, I have to figure out how to change that. I'm Jennifer Gitakis on Facebook, just so you know who you're talking to lol. I also shared your talk show info with one of my childhood best friends mom who is a very recently diagnosed mets patient. She just had her first chemo so I'm hoping that she will at least listen, even if it's only for camaraderie.